It's been 90 years after the end of the old world. Most of the surviving population of the Known world live in Iceland, the largest safe area in existence, while the safe settlements in the other Nordic countries; Norway, Sweden, Denmark and Finland, are small and scarce. Countless mysterious and unspoken dangers lurk outside the safe areas, the Silent world, and hunters, mages and cleansers will spend their lives defending the settlements against the terrifying beings. Because of a great fear towards everything in the Silent world no official attempts to explore the ruins of the old have been made, and most of the information about it has turned into ancient lore, known by few. But now, at last, it is time to send out an research crew into the great unknown! A poorly funded and terribly unqualified crew, but a crew nonetheless. 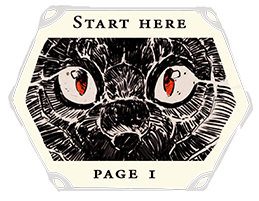 Miscellaneous comic info: SSSS began in November 2013, and normally updates on Monday, Tuesday, Wednesday, Thursday and Friday. In 2015 SSSS won the Reuben award for "best online comic-long form", which was mind-blowing. 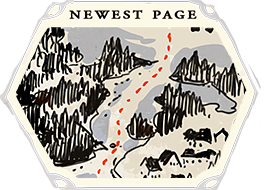 I'm Minna Sundberg, a Finnish artist and writer and the sole creator of this comic. I was born in Sweden in 1990 (to Finnish-born parents), have lived most of my life in Finland and speak both Finnish and Swedish. I got myself a bachelor's degree in graphic design from the university of industrial arts in Helsinki in 2013, and during my two final years of those studies I drew my first proper webcomic, A Redtail's dream, a 556 page tale built around concepts from Finnish mythology. It was a sort of practice comic that I made before starting SSSS because I didn't feel comfortable enough making comics to start my big dream project right away. After that I've been making my comics fulltime as my job. If you're in need for a business contact regarding "Stand Still. Stay Silent" the best way for that is to directly contact the comic's publisher, Hiveworks comics.